Leapp wanted to distinguish their brand in an expanding market of refurbished Apple products. They knew they could exploit the green/recycle story in their brand communication, but they weren’t sure how. We worked to help them identify a wider target audience, develop their visual identity, and shift from a product-oriented perspective to a relationship/service-oriented approach. Leapp had been promoting themselves in a tech-oriented way, primarily towards men. They weren’t speaking to the women who often manage the household budgets. Men tend to be more ‘gadget minded’ and are quicker to buy new devices. But women running households tend to be smart about cost-saving and often want to support ‘green’ companies. It made sense to harness both the cost-saving and emotional benefits of Leapp in an approach that would speak to women (without forgetting the men!). Rather than listing dull and difficult tech specs, we decided to communicate the benefits of Leapp from the customer’s perspective. For the campaign visuals, we shot everyday models and doodled their ‘inner thoughts’ around them. This let us bring the product benefits to life in a clear, sweet way. By using bold colours and adding a dash of charm to the tone of voice, we created a warm style. 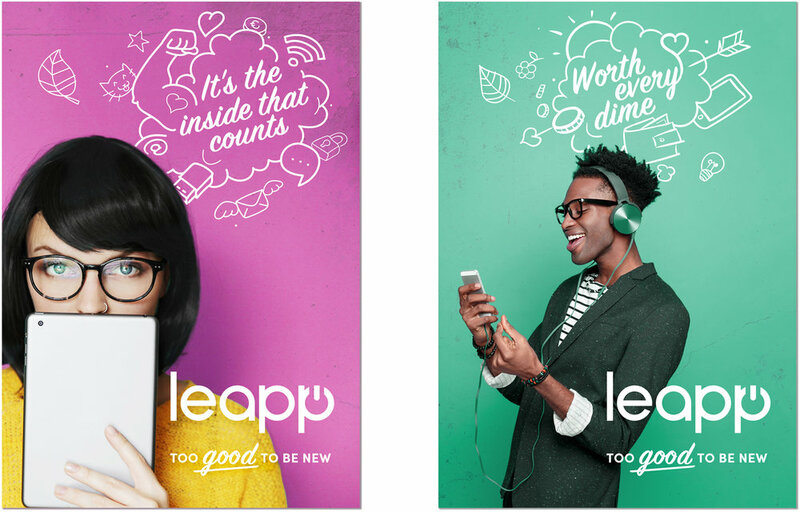 Leapp communications look less ‘tech’, and more personal—more human. The text balloons show the ‘inner thoughts’ of customers. Instead of listing the technical specs, we depict what the tech features really mean to a user. The #hilariousdiscountdays sales campaign targeted a broad audience, promoting high-end tech for hilarious prices. An engaging newsletter was designed to add to the user experience, rather than simply drive sales. It contained handy tips and tricks about how to use Leapp’s products. The doodles, colours, and photography made the content engaging and easy to read.